Create a HTML file named "simple.html", having the following data. Less facilitates you to customize, manage and reuse style sheet for web site. 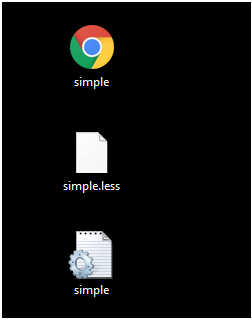 Now create a file named "simple.less". It is similar to CSS file. The only one difference is that it is saved with ".less" extension. This will compile the "simple.less" file. A CSS file named "simple.css" will be generated.